April Murphy earned her B.S. in Accounting from University of Delaware in 2007. She then lived and worked in Philadelphia, PA, Sydney, Australia, and Dallas, TX as a financial consultant. 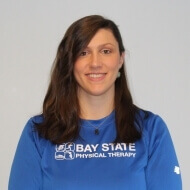 She then went back to school and is a graduate of the MGH IHP DPT program in 2019 with clinical experience in the inpatient and outpatient settings, with a focus on vestibular therapy, balance disorders, neurological deficits, and orthopedic injuries. She enjoys working with patients of all ages utilizing manual techniques, therapeutic exercises, and functional movements to work with patients to achieve their goals. She enjoys trail running, hiking, biking, volleyball, going to concerts, and board games with husband, family, and friends.